Large, complex change – especially transformational change – impacts people and processes across boundaries (boundaries of role, function, process, and organization). Organizational transformation demands cross-boundary support among your top executives; this support is a non-negotiable requirement of success. As CEO, it is your job to create alignment, commitment, and support in your top executive team to ensure they are individually and collectively doing all that is necessary to make your company transformation successful. This is key to your role as the sponsor of this level of change. Unfortunately, political dynamics often impair change efforts. Not only do some executives refuse to work together, they may actively work against their peers’ agendas. When you are transforming the whole enterprise, or any major segment of it, you need all your executives leading as a unified team, not fighting each other overtly or covertly. Most senior leaders see themselves as responsible for leading their own functions. They naturally think first about the success of their business unit, process, or function and orient to the success of the enterprise second. At a distant third, they may support their peers’ needs and success. The silo orientation can create and stir the political dynamics that inhibit an organizational transformation. How true is this for your team? The silo orientation among those at the top often creates internal competition for power, resources, staff, project priority, compensation, promotions, and general attention. If this internal competition goes unchecked, it manifests into power struggles, alliance building, internal resistance, and withholding of support or information from other executives’ agendas. For a transformational change to be successful, all leaders, and everyone else impacted, need to be on board and do what is best for the change to succeed. As much as leaders assume their political behavior is invisible, it is glaringly obvious! Trust us, your subordinates can see the dissension among your leaders; we hear this from them all the time. And you can hardly expect them to work together and support a change initiative if the top executives are not. How do you address damaging company politics and ensure your top executives are on board with your change initiatives? How do you get them to focus on what is best for the overall enterprise, and do what that requires of them, instead of doing only what favors their own function? The political terrain among the top echelons may be so fraught with conflict you may be hesitant to address it, no matter how costly the finger-pointing and backbiting is to the overall performance of the organization. Discussing the quality of your relationships with each other may seem impossible and threatening. You might even think it is better to leave things alone. However, in your gut, you know that such dysfunction will destroy any chance for success in your large change efforts. Leaving it alone is also a reflection of your leadership. As the overall sponsor of the effort, your job starts here! Set the context that the success of the overall transformation requires they lead as a unified team. 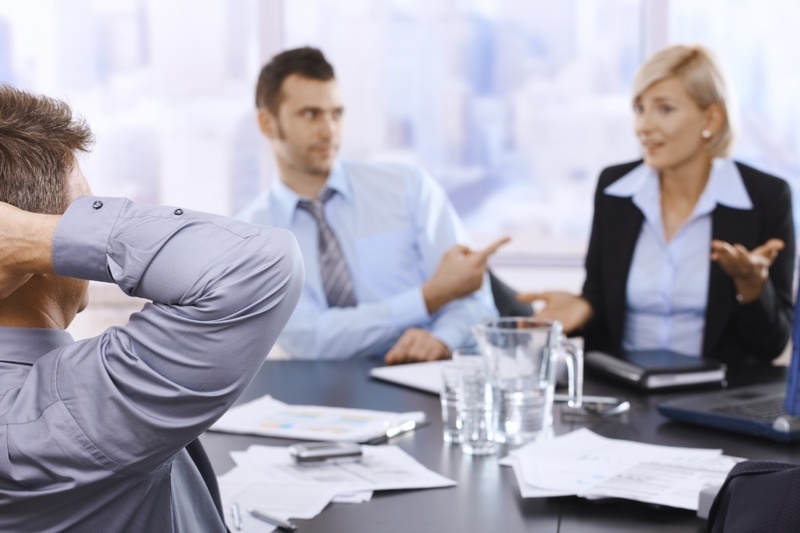 Objectively describe the known dysfunctions in your team, including historic power struggles and lack of alignment, communication, and support. Start with owning up to the political patterns you are a part of. This may take courage, but the ROI will be substantial. You may need experienced external facilitation support for this, as many executives are not comfortable doing this level of interpersonal work with internal resources. Secure the agreement of team members that your change effort is a direct vehicle and requirement for implementing your organization’s business strategy. (By the way, if it is not, you should stop the effort!) 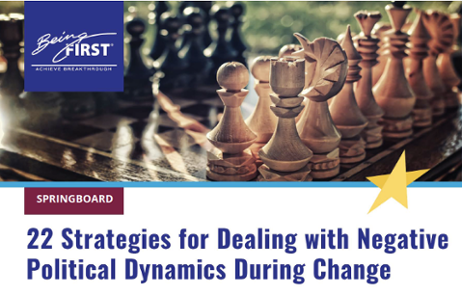 Since your top team is responsible for business strategy success, demonstrate how the change effort both supports the enterprise and them in their role as a senior leader. Collectively explore and determine how the scope of your transformation will impact their areas of responsibility. Make sure they understand the tangible ways the change will influence their operations. They need to be clear and aligned with the coming impacts and feel secure that the future state will add value and reduce cost to them. Ask their input to help you design your effort so it meets their needs. Once they are clear about the desired outcome of the transformation, they will likely have valuable design requirements that serve the needs of their part of the organization. Ask them to commit to model the changes in behavior that the new state requires of them and all leadership. Make the new behaviors explicit, and tie them to the company’s cultural values. Make sure you model these behaviors as well! Let them know how you will inform and involve them throughout the change and what you will need from them over time. Get their agreement to partner with you for success. By interrupting the natural propensity of executives to think first about the success of their business unit, process, or function and creating alignment, commitment, and support in your top executive team you will reduce organizational politics and increase the opportunity for success in your change initiatives.